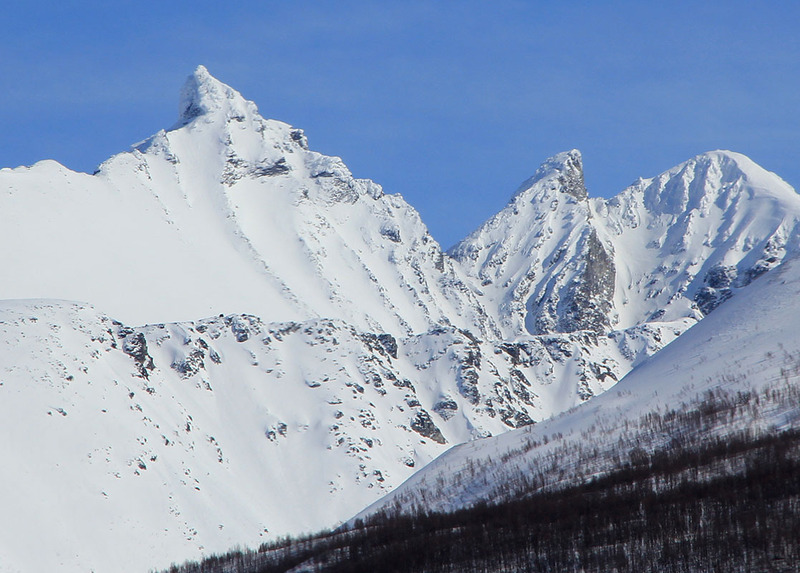 How to get there: Drive south from Tromsø along Hwy. E-8, 24 kilometer to the small place Fagernes. Make a left turn here onto Hwy. 91 towards Breivikeidet. First note the left turnout to the research station, then cross the creek that comes from Bjørnskarddalen on your right. Continue passing the farms Granheim and Storslått and a nearby hill called Vartavarhaugen. Just before the next creek coming from your right, there is a small turnout. Pull in there and park. The GPS location is north 69:35.419, east 019:17.058, elevation 75 meter. There are tractor tracks leading a bit further uphill to a very nice site for camping (about 100 meter). The location is near ideal as a "base camp" site for this climb. Route description: From the road, head straight uphill through birch forest. The trees are well separated and the terrain indeed very nice for walking. As you exit from the trees, the tree line is very precise, continue up the broad ridge that gradually becomes more distinct higher up. The ridge traverse can be said to start at about 1000 meter elevation, this location is north 69:34.437, east 019:20.082. In early June, when we did this hike the terrain was free of snow up to this point, surprisingly high compared to a snow line of about 500 meter on many other mountains. Continue up the ridge across the first hump. 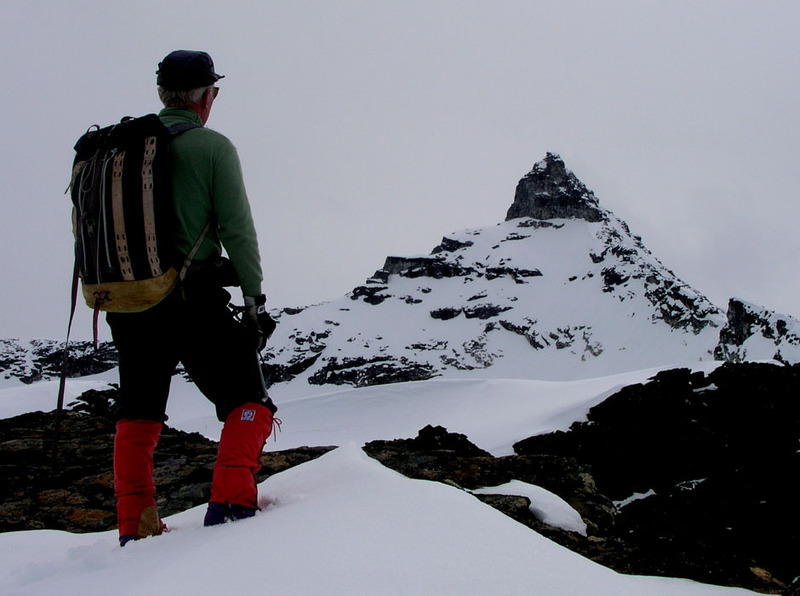 You will now see the route ahead, a distinct subsidiary peak on the ridge further ahead, while Hamperokken stands proudly at the end of the ridge that curves left. Generally, the route stays on top of the ridge, in the early part a couple of difficulties may be circumvented on the left side, later the ridge will have its more gentle side to the right. 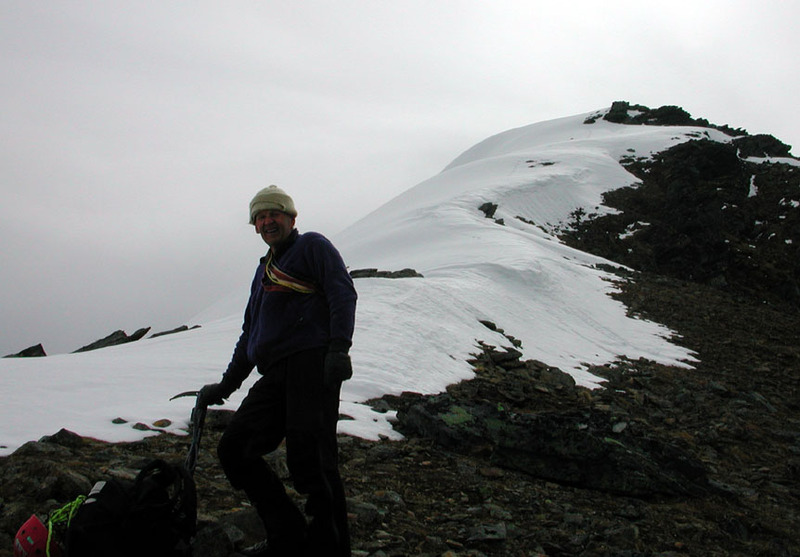 Climb directly over the distinct subpeak at location north 69:34.063, east 019:20.534, elevation 1171 meter. After a short descent the ridge now becomes a bit wider and more level, progress will improve as Hamperokken looms ever closer. 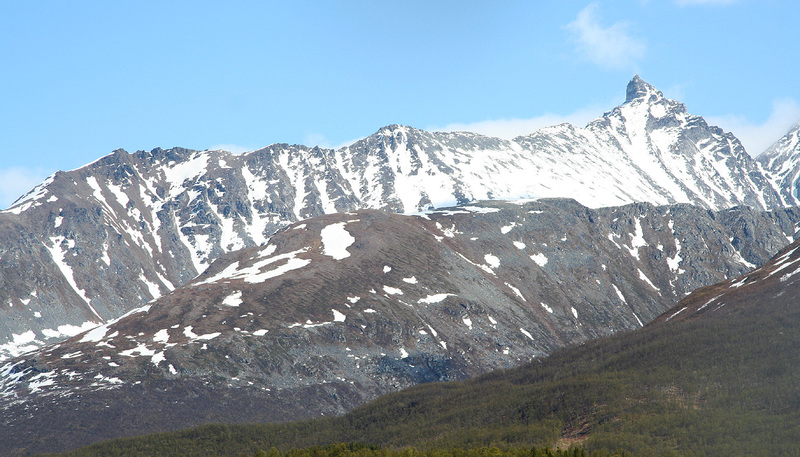 Observe the gully that extends up on Hamperokken to the right of its rock face as seen from the ridge. This gully is the key to success after the ridge has been completed. The very last hump of the ridge carries more class 3 climbing followed by a flat, but very narrow and exposed section. 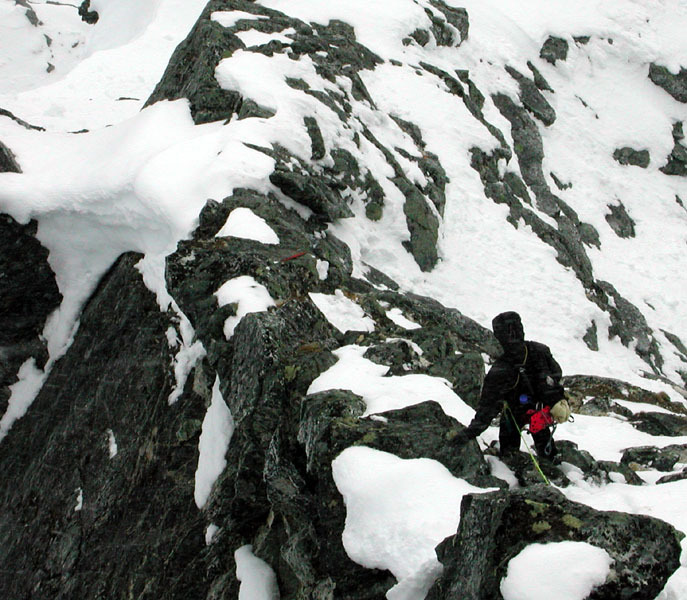 You finish this part by lowering yourself into a small notch that marks the end of the ridge. This last hump can alternatively be circumvented on the right side by way of a short descent. Either way, traverse into the gully on your right side and ascend this all the way until you gain the south ridge of the peak. This location is north 69:33.714, east 019:21.494 and about 1375 meter of elevation. (This will be your right side of the gully as it tops out towards the south ridge.) Climb close to the this ridgeline having significant exposure off to the east, then more in the middle of the face for the very last pitch. This last section is only about 40 meter. Parties may choose to use a rope for added safety here, especially if the conditions are less favorable. 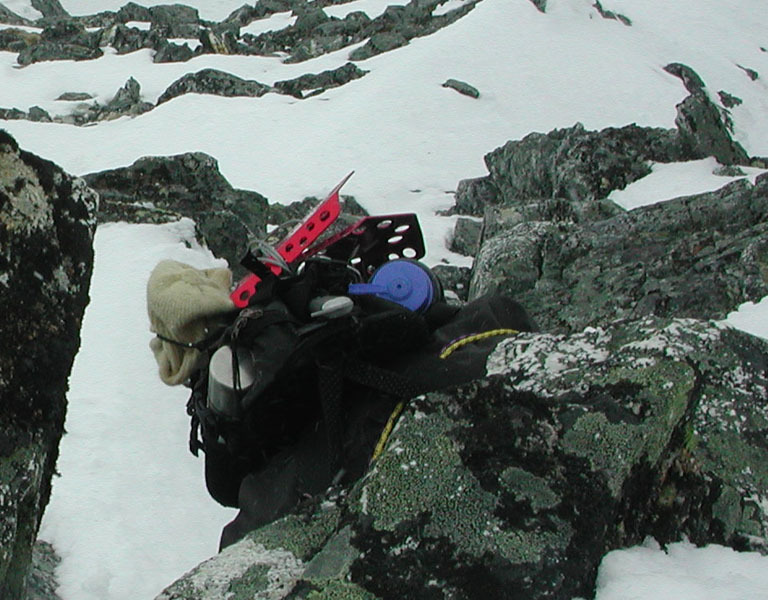 Most of the ridge traverse on this route is (YDS) class 3, however this last section before the summit is class 4. 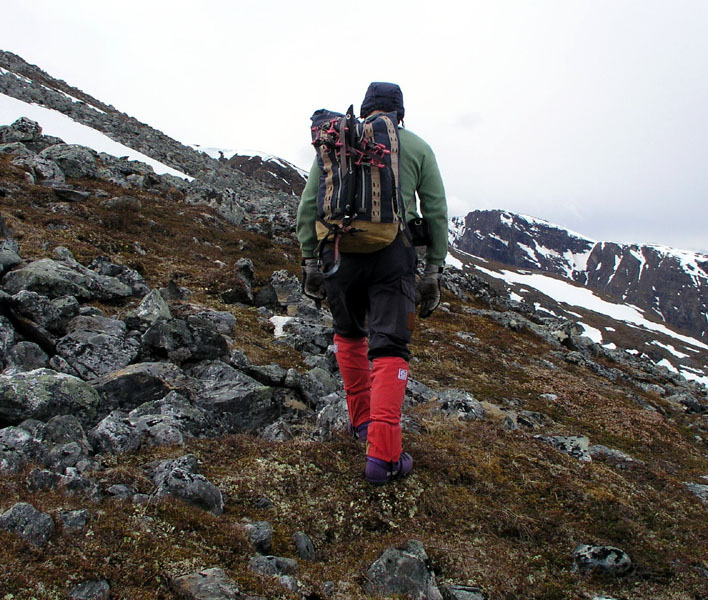 On the return, one may consider a careful descent that just continues down below the gully all the way down to the small lake visible at the valley floor. However, this may not be much quicker than a return along the ridge, see my comments below. Comments: I did this climb with Bjørn Hafskjold. We started at 0830, hit the summit after 6 hours at 1430, struggled with deep, rotten snow and returned to the car after 10.5 hours. 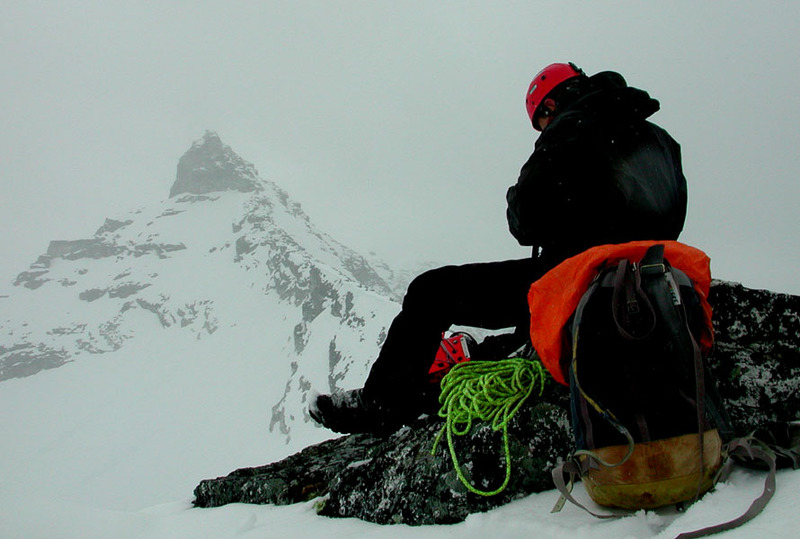 We climbed this route with a layer of 5-10 cm of new snow and generally wet and foggy conditions. This made the rocks slippery in places as well as hiding locations for foot and hand placement. 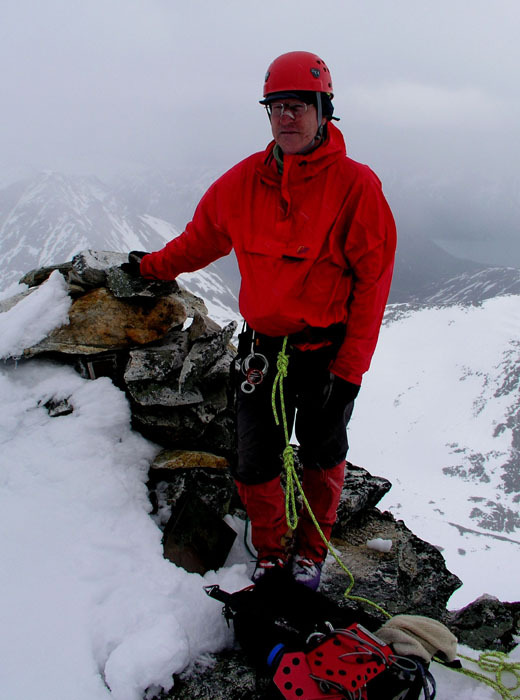 In fact, Bjørn slipped and fell, slightly injuring himself while traversing the ridge. Fortunately, this mishap came in a non-critical location and with no serious consequences. Still, it served as a reminder that such conditions increase the difficulty and potential danger considerably compared to a day with dry rock all along. 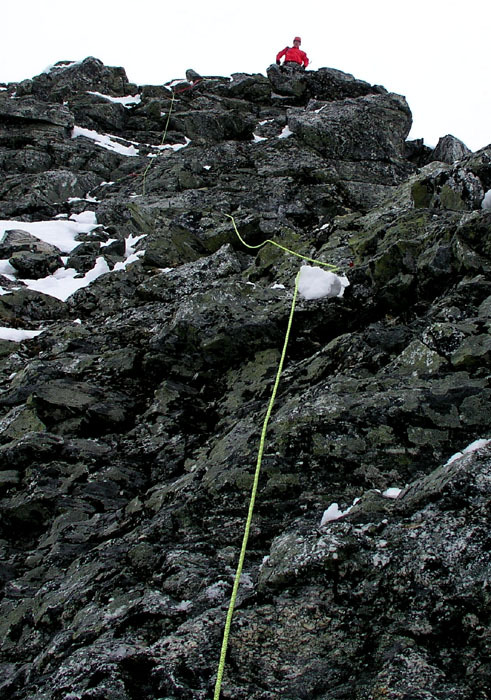 The short rope that we carried was just long enough for the last pitch and provided an extra margin of safety. 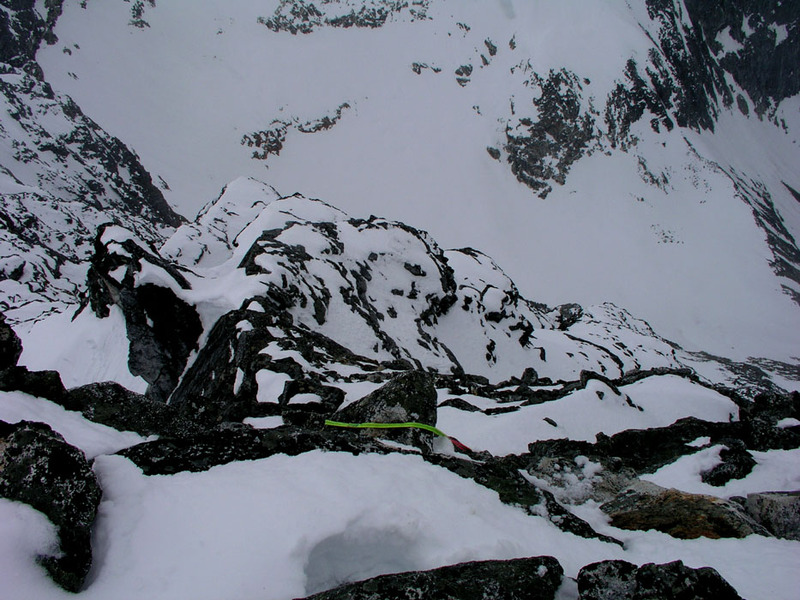 It seems clear that this section may be somewhat easier with more spring snow suitable for crampons, later in the summer dry rock and no snow should also provide better conditions. The summit register listed one visit on May 8th. and one Easter visit on April 25th., before that a climb from mid September 2003. Clearly, this peak does not see many visitors. 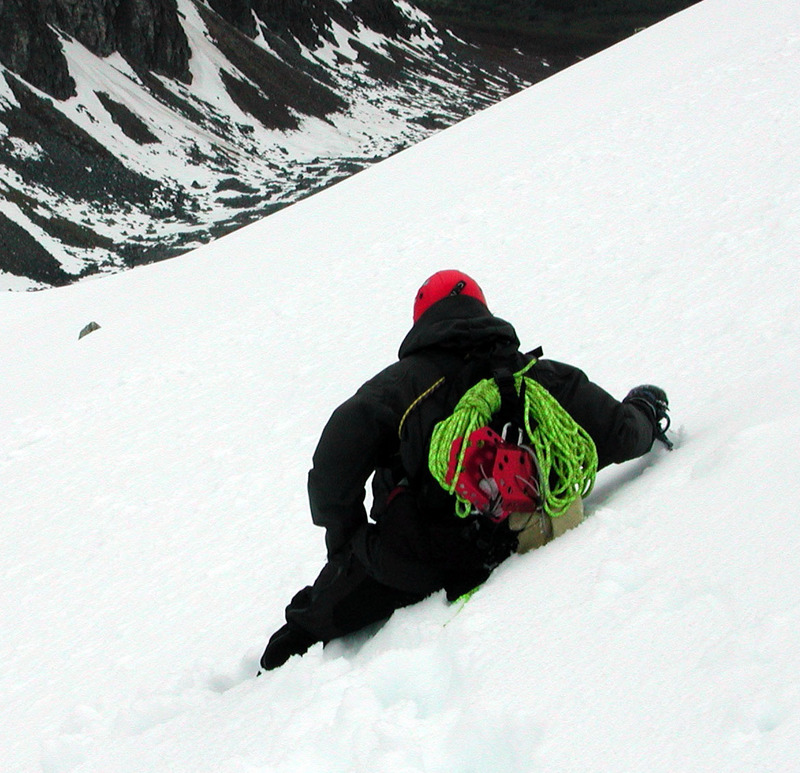 We believed that a descent on snow down the gully would be quicker and also better for old knees, however, the rotten snow turned this into an epic struggle. Overall, a ridge return would have been equally fast and much more pleasant. We drove back to town for a well deserved dinner then continued to set up base camp for Store Blåmann. Hamperokken on May 9th. 2012. 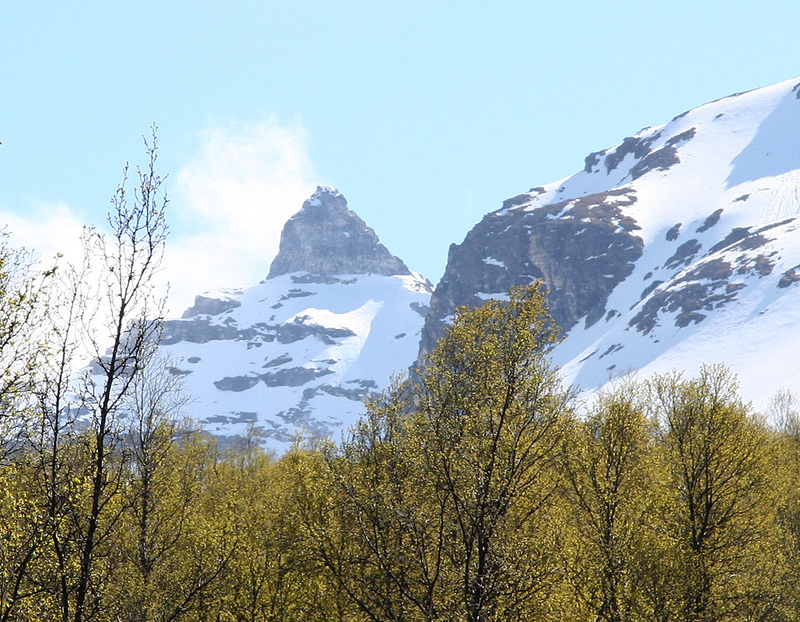 Hamperokken and the ridge we climbed as seen from Fagernes on June 8. 2008. Hamperokken as seen from north-east on June 8. 2008. 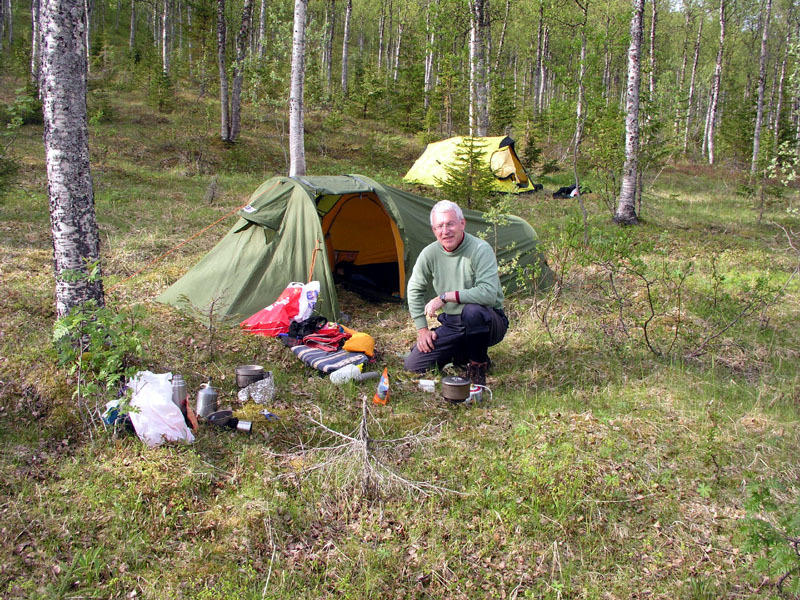 Our base camp the night before climbing Hamperokken. Bjørn Hafskjold above tree line heading for the Hamperokken ridge. The proper ridge begins, at elevation 1000 meter. 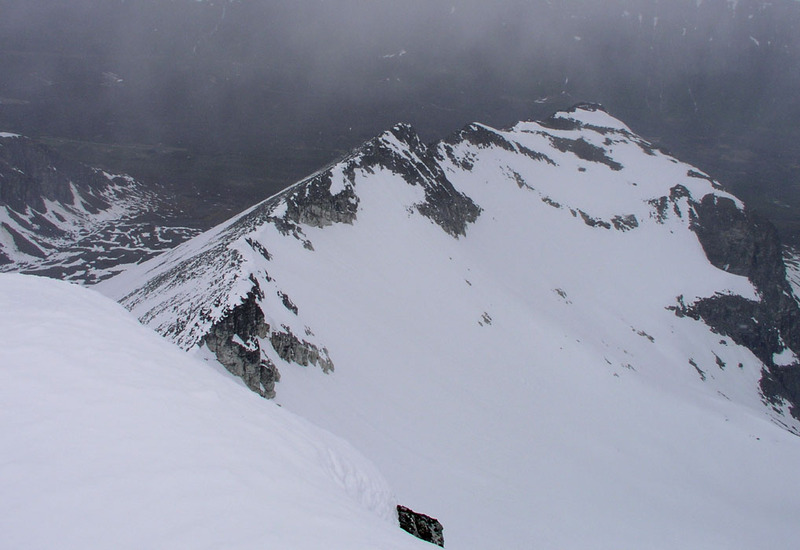 Bjørn on the ridge as Hamperokken comes into view. Petter, sitting on the ridge looking towards our target. Looking down, the route comes up this gully. The new snow obscured and made the rock slippery. 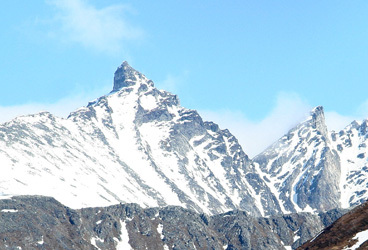 The Hamperokken ridge as seen from the summit. Downclimb, I have started down, looks like a moving backpack. Along the south ridge, this is steeper than it looks. Looking up the last section.